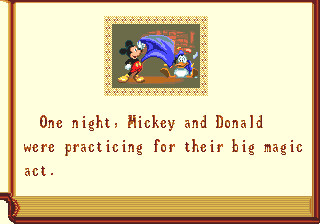 With all the success that Mickey and Donald brought with their individual adventures, it only made sense to team them up in what would be their biggest adventure yet. 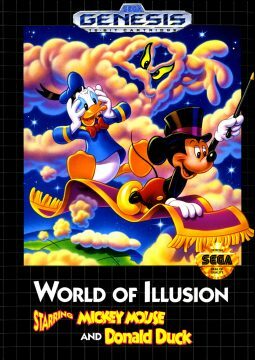 World of Illusion was once again spearheaded by Emirin, and the development team remained virtually the same from Castle of Illusion and Quackshot. At this point in time the team called themselves Illusion Shot Pictures and is the same team that went under the name AM7. 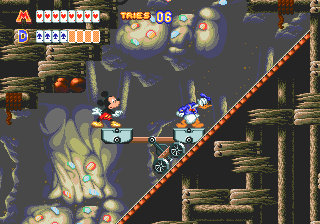 This game does not use Quackshot much as an influence, rather presenting itself as sequel to Mickey’s Castle of Illusion both in terms of art style and gameplay. Mickey and Donald are traveling magicians who do show acts together. 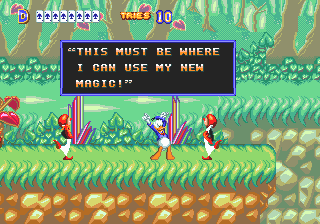 One day during preparations, Donald gets taken by surprise by one of the magic tricks and falls back, back into the curtain, where they find a mysterious magic box. 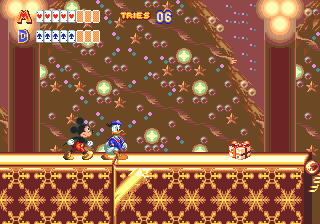 While Mickey is cautious of the box and its unsettling glow, Donald gets restless and wants to make use of it in their act. Before Mickey can stop him, Donald falls into the box and leaves Mickey no choice but to follow him. What awaits them is a magical world which is ruled by an evil magician, who tells our heroes that they will have to learn themselves some new tricks in order to return home to their own world. 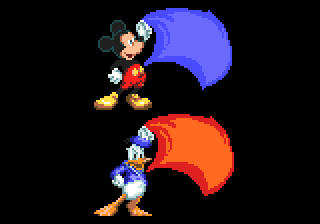 Luckily for Mickey and Donald, they have their magic cloaks with them in order to defend themselves against whatever awaits them. As you might have guessed, Donald is more reckless in this game than when he appeared to be in Quackshot. His overall behavior, mannerisms and facial expressions are also more in line with the rather ill tempered cartoon character than his mellowed comic counterpart. World of Illusion takes place across five levels, each usually separated into three or four sections before the boss fight takes place. 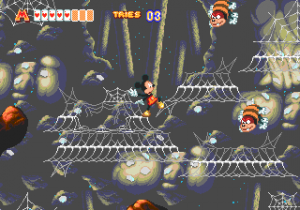 The worlds are reminiscent to the ones found in Castle of Illusion. Seeing that the duo has been transported into a new mysterious world, there isn’t much in the way of recognizable landmarks or places within Duckburg, however the world within the magic box is still very familiar. 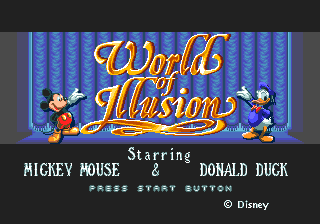 World of Illusion takes place in a hybrid of classic Disney cartoon worlds, and puts Mickey and Donald is sort of a bizarro Disney universe where they sort of fit in, but at the same time they feel quite out of place. The art design borrows heavily from Disney’s Alice in Wonderland. 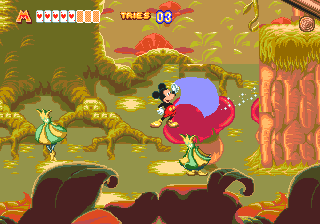 The creatures and characters within the world looks very similar to the ones found in the 1951 Disney classic as well, with the last few levels of the game fully embracing it and pitting the duo against card soldiers and the Mad Hatter. Probably the most interesting cameo is Madam Mim from The Sword in The Stone who randomly appears as a boss late in the game. The rest of the enemy roster consists of original creations though designed very carefully to fit within the Disney standard. 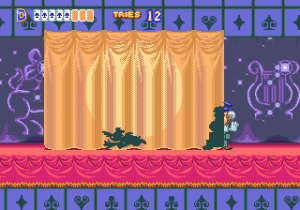 Several stages takes inspirations from other Disney classics as well, such as the underwater kingdom from The Little Mermaid and the flying carpet rides in the clouds like Aladdin. 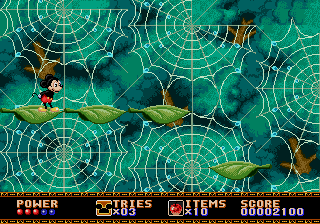 It also revisits some ideas from Castle of Illusion with both games starting out in a similar forest area, a spider cave, a library with the protagonist being affected by miniaturization and again using a candy inspired level. Even in the level design, these stages seems to be very similar to their counterparts found in Castle of Illusion. 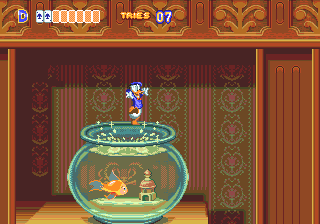 The background design helps make World of Illusion truly mesmerizing. 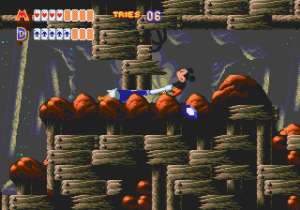 What really sets this game apart from most other Disney game is the uneasy feeling it gives from the use of foreground and background details, along with the effective color use and lighting effects, giving the game a very surreal and sometimes bizarre mood that again is owed a lot to its roots in Alice in Wonderland. 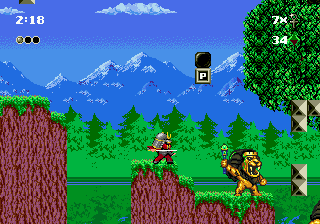 The background and foreground scrolls at different rates than the scrolling of the midground action, and creates a sense of deepness and world within, which often shows small characters or other small details which helps to bring the world truly alive outside of just what takes place right in front of the heroes. 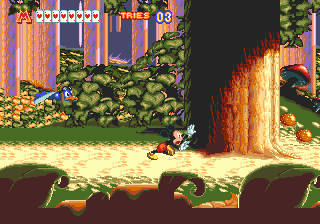 Another darker aspect of the game is the fact that the worlds and situations seems to be more nightmarish in basis than the more light hearted areas found in Castle of Illusion. Whether it is the oversized killer pop up books, deep dark underwater caves, Donald getting stuck in tight places or both heroes running in full panic and shivering as they duck down, there are many unsettling details that constantly reinforce a feeling of discomfort and fear. Each level is so diverse and different from the other that it never allows the player to really settle in and take the ride for granted, rather keeping the mind up and alert, always wondering what is next. 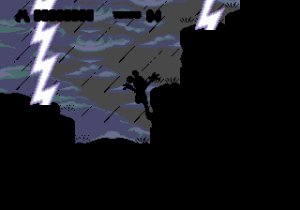 Another unique graphical detail is the use of weather effects and foreground set pieces which sometimes will make it so you only see the shadows and silhouettes of the characters on screen, which creates some truly awesome visuals and atmosphere. The crowning achievement of this game and most important to any video game is, naturally, the gameplay. 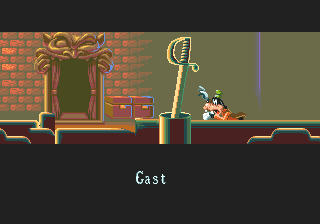 This is where World of Illusion truly shines. Basically, the three modes allow for three different routes. 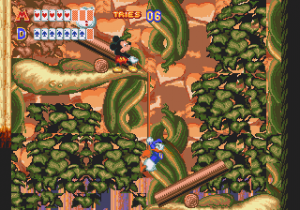 Single player allows for the choice of either playing as Mickey or Donald. They play largely the same, with no differences in their immediate abilites, having the same speed, jump and attack as one another. Mickey has one advantage over Donald however, he is able to crawl under small cracks and through tight spaces, while Donald simply is carrying too much junk in the trunk, and gets stuck when trying. This leads the single player mode to be different depending on which character you choose. 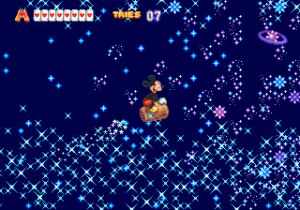 Mickey’s route is more based around platforming and longer stretches of tranquility, while Donald’s route is filled with more immediate dangers, enemies and overall more difficult, to go along with the notion that he is too careless and short minded. The basic attack in the game is a magic cloak which shoots a small stream of magical dust which upon impact, will make enemies into elements and symbols of good like butterflies or flowers. Each level also introduces a new magic spell to help the duo to overcome the dangers ahead of them, like magic bubbles that allow them to breath underwater or stacking card soldiers to create bridges or platforms to venture over big gaps. The co-op mode is the way the game was truly intended to be played, in that it makes full use of both characters and provides the longest route along with all new challenges. 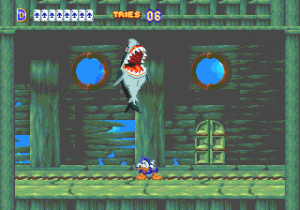 For the most part, two player modes in platformers had always been either taking turns if the other player died or a competitive race to get the most points or pick up the items and power ups scattered around. There was little emphasis on actual cooperation and interaction between the players beyond just killing the baddies on screen and walking in the same direction. 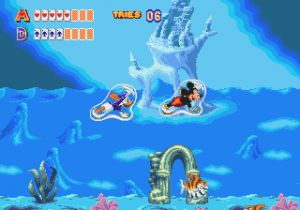 World of Illusion does away with any turn taking or competitiveness and requires the players to think together and work together at all times. 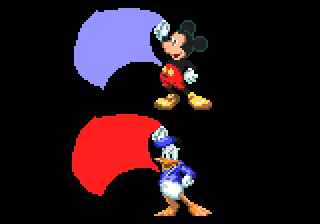 If Donald gets stuck, it’s up to Mickey to pull his large behind out so he can keep up and if one finds themselves on a higher ground than the other, it’s up to one of them to lower a rope and drag the friend in need up. The attention to detail here is also very important, as the way Mickey and Donald help each other makes use of a lot of body language and facial expressions that show a lot of care and compassion for one another, leading the game to have a somewhat heartwarming and reassuring emotional aspect in the midst of all the unknown fears and challenges. 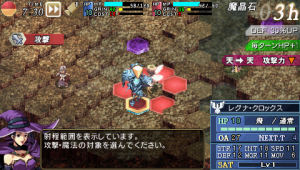 Like with the individual quests, the co-op route opens several levels exclusive to that mode, often featuring some kind of requirement of working together, either on a two man mine cart or jumping off each other’s shoulders. 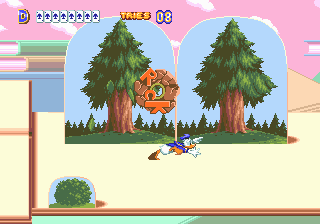 Capcom also tried their hands on co-op platforming in their Disney effort, Chip ‘n Dale Rescue Rangers, released in 1990 on the NES. 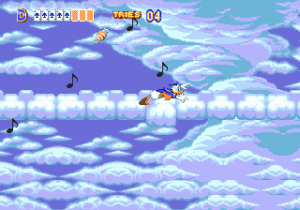 The music and sound effects are also top of the line in what the Genesis can produce. A lot of Mickey and Donald’s actions are accompanied by individual voice samples, which in many cases sounds like a strangled ostrich on the Genesis, but in this case they sound surprisingly crisp and clear. The compositions are more ambient and atmospheric than what was heard in Castle of Illusion and Quackshot, and helps bring the feeling of the levels out especially the wonderful first stage theme. 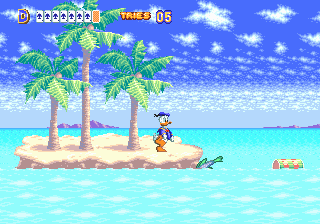 There are some touches of brilliance in the tracklist also, like the waterfall stage music for Donald, which is a banjo old-time tune with a Donald Duck bickering lead which is quite hilarious. All the music is very appropriate in their context, just not as memorable and catchy as the preceding games. The music was handled by sound producer Lotty and composer MAGURO. Their real names have never been disclosed so it is unknown what other games they have worked on outside of the Disney games. 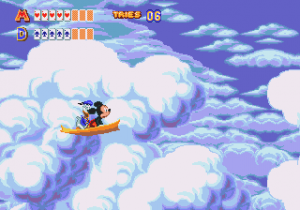 World of Illusion is an amazing game. It’s one of the most solid, well rounded and artistically impressive platformers of the era, and one of the best 2 player co-op games to date. From animation to controls, it’s a joy to play and with the three alternate routes, it’s versatile enough to be played over and over again. The only minor complaint is the somewhat floaty physics and overall ease of the game. There are in total over a dozen levels, but none get excessively challenging, which is probably due to kids being the intended audience. That should not scare away anyone of more mature age as it never stops being fun, especially with a second player to enjoy the adventure with. 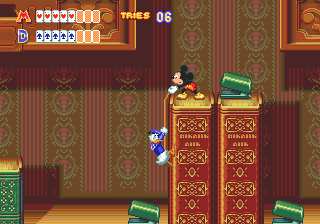 In some ways, the usage of Alice in Wonderland is puzzling with a game based around Mickey Mouse and Donald Duck. 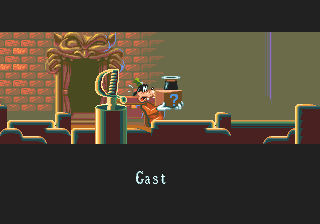 This might have been because Sega planned on a developing a video game adaptation for Alice in Wonderland, but either got stuck in license difficulties or just opted to use the more established heroes. Whatever the reason for this mixture, it’s like peanut butter and jelly, it works wonderfully despite sounding a bit off on paper. 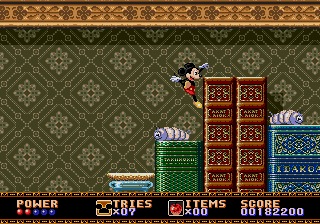 A semi-sequel to this game and a direct one to Castle of Illusion, Land of Illusion, was released in 1993 on the Master System and Game Gear. Mickey was the sole playable character in that game, with Donald only appearing in a cameo. 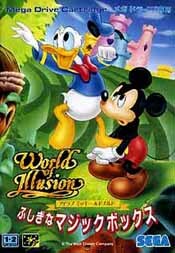 World of Illusion was released as I Love Mickey & Donald: The Mysterious Magical Box in Japan. A beta version exists on the internet with several differences from what was found in the final released product. A writer by the name Ragey has detailed many of these differences on his website. This beta also contains unused music or different versions of what is heard in the final version. The beta has Goofy running around left and right without anything in his hands. In the final, he has his hands full. The sword is also lowered into the foreground. 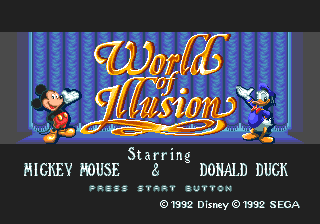 On the title screen is different with Mickey’s eyes look at the logo. It also lacks proper credits. In the final, Mickey’s eyes meets the player’s. The sprites also have darker shadows. The storybook scenes are all in faded brown in the beta. In the final it is fully colored, but with less background detail. The cloaks in the beta have no shading and are one solid color. The cloaks in the final are fully shaded and differently colored. compared to the one found in the final product.